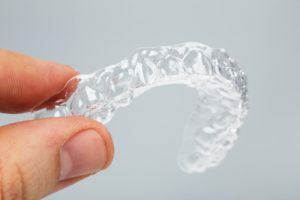 As you transition from pair to pair of aligners, it’s important that you follow the golden rule of treatment: wear them for at least 20 to 22 hours per day. Remember, aligners are slowly shifting teeth as you wear them, so discomfort is a normal part of the process as you start wearing a new pair. However, if you don’t wear your aligners for long enough, the discomfort that’s supposed to go away on its own simply won’t. Luckily, there is a way to address this issue head-on. Wearing your aligners throughout the day can be very difficult, but wearing them at night is a sure way to skip that pain in the first place. As long as you plan to switch ahead of time, you won’t have to be awake to feel any of the discomfort. The teeth and gums will likely be sore for the first day after wearing a new pair. That means you will need to avoid foods that would be sensitive to your tender gums and shifting teeth. Avoid eating foods that are crunchy, hard or chewy as these can put undue stress on your gums, teeth and jaw. Once you’ve adjusted and the discomfort has gone away, you can start eating these foods again. During the first days of wearing your aligners, keep painkillers on you in case the discomfort becomes too difficult to ignore. The best medications include ibuprofen, acetaminophen and naproxen sodium. These work to reduce inflammation and alleviate aches in the body. Avoid aspirin which can cause burning sensations to inflamed gums. If you’ve ever hit your knee while playing sports or taken a hit to the face from a basketball, you were probably given a cold compress to reduce any swelling or bruising that appeared. The same logic can be applied to pressure applied to your cheeks and lips. Just make sure to apply the cold compress to the outside of your mouth, doing so in 10-minute intervals two to three times a day. Looking for additional tips to manage orthodontic discomfort? Speak with a dentist today; they can tell you everything you need to know about clear braces in Wethersfield! Dr. Thomas C. Dolan earned his DDS degree from the New York University College of Dentistry. For 30 years he’s been staying on the forefront of new technology in dentistry, including orthodontic treatments like Invisalign. If you’re struggling with your transition to new aligners or wanted to get started yourself, you can contact him through his website.